رضایی کهخا, محمد رضا, پیری, جمشید. (1395). حذف رنگ راکتیو قرمز از فاضلاب توسط خاکستر اصلاح شده گیاه حنظل. مجله آب و فاضلاب, 27(3), 32-37. محمد رضا رضایی کهخا; جمشید پیری. "حذف رنگ راکتیو قرمز از فاضلاب توسط خاکستر اصلاح شده گیاه حنظل". مجله آب و فاضلاب, 27, 3, 1395, 32-37. رضایی کهخا, محمد رضا, پیری, جمشید. (1395). 'حذف رنگ راکتیو قرمز از فاضلاب توسط خاکستر اصلاح شده گیاه حنظل', مجله آب و فاضلاب, 27(3), pp. 32-37. رضایی کهخا, محمد رضا, پیری, جمشید. حذف رنگ راکتیو قرمز از فاضلاب توسط خاکستر اصلاح شده گیاه حنظل. مجله آب و فاضلاب, 1395; 27(3): 32-37. فاضلاب‌های رنگی اثرات زیان‌آور بسیار جدی بر محیط زیست دارند. افزایش شدت رنگ باعث کاهش میزان ورود نور به محیط آبی و تغییر رشد گیاهان و بی‌مهرگان می‌شود. روش‌های بسیاری برای حذف ترکیبات رنگی از فاضلاب وجود دارد که از آنها می‌توان به جداسازی غشایی، فرایندهای اکسیداسیون، انعقاد و تصفیه بی‌هوازی اشاره کرد. همه این روش‌ها هزینه‌بری بالایی دارند. فرایندهای بیوجذب از جمله روش‌های کارا، مؤثر و ارزان قیمت برای حذف بسیاری از آلاینده‌ها مانند فلزات سنگین، ترکیبات فنلی، رنگ‌ها و غیره است. 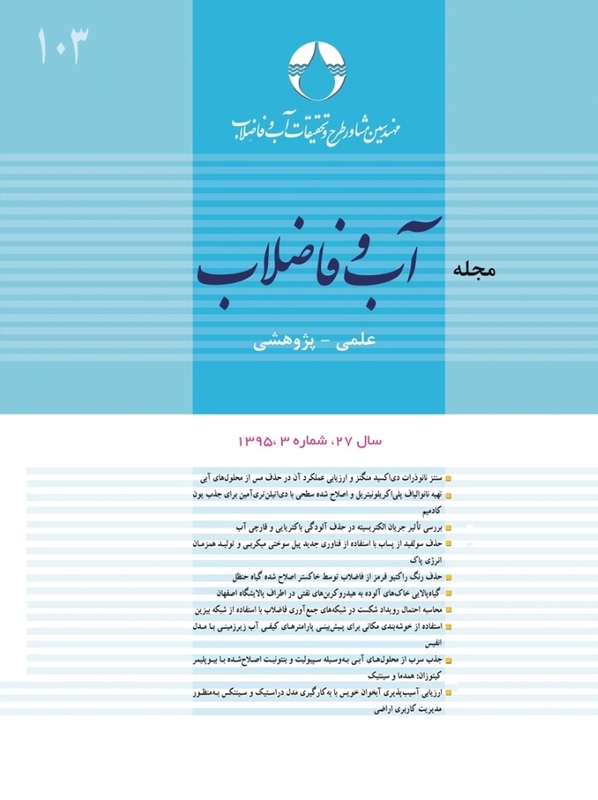 در این تحقیق استفاده از یک بیوجاذب به نام خاکستر گیاه حنظل برای حذف رنگ راکتیو قرمز برای نخستین بار مورد بررسی قرار گرفت. برای افزایش راندمان حذف، سطح خاکستر گیاه به‌وسیله هیدروکسید سدیم اصلاح شد. اندازه‌گیری‌ها و میزان حذف به‌وسیله اسپکتروفتومتر انجام شد. همچنین اثر پارامترهای مؤثر بر حذف رنگ مانند غلظت اولیه رنگ، دز جاذب، pH و زمان جذب نیز بهینه شد. مطابق نتایج بهترین شرایط حذف رنگ در غلظت اولیه 01/0± 90 میلی‌گرم در لیتر، دز جاذب برابر 01/0± 75/1گرم در لیتر، pH معادل 2 و زمان 70 دقیقه به‌دست آمد. بررسی‌های انجام شده نشان داد ایزوترم جذب از معادله فروندلیچ پیروی می‌کند. همچنین در بهترین شرایط جذب، ظرفیت جذب جاذب برابر 36 میلی‌گرم در لیتر در pH برابر با 2 به‌دست آمد. نتایج نشان داد که خاکستر اصلاح شده حنظل، جاذب مؤثری برای حذف رنگ از فاضلاب‌های رنگی است. Dye-bearing wastes pose serious risks to and leave harmful effects on the environment. Increasing wastewater color intensity leads to reduced light reaching the aquatic environment, which adversely affects the life and growth of aquatic plants and invertebrates. Among the many methods available for dye removal from wastewater, membrane separation, oxidation, coagulation, and anaerobic treatment are more common but they are all costly and involve complex processes. Biosorption, in contrast, enjoys both ease of application and simple design so that it is widely used for removing dyes, heavy metals, and phenolic compounds from both water and wastewater. In this paper, the ability of citrulluscolosynthis ash as a bioadsorbent for the removal of reactive red dye is investigated for the first time. Sodium hydroxide is also used to modify the plant ash surface which expectedly enhances its dye removal efficiency. Measurements and removal levels are determined using a UV-vis spectrophotometer. Finally, the effects of pH, adsorbent dosage, dye concentration, and reaction time on dye removal efficiency are also explored. Results show that the optimum conditions to achieve maximum dye removal are as follows: A pH level of 2, an adsorbant dosage of 1.75 g l-1, an initial concentration equal to 90 mg L-1, and A reaction time of 70 min. Adsorption isotherm is found to obey the Ferundlich isotherm. Also, an adsorption capacity of 36 mg g‒1 is achieved under the best conditions. It may thus be concluded that modified citrulluscolosynthis ash can be used as an effective adsorbent to treat colored wastewaters. 1. Paul, J., Rawat, K. P., Sarma K. S. S., and Sabharwal, S. (2011). “Decoloration and degradation of reactive Red-120 dye by electron beam irradiation in aqueous solution.” Applied Radiation and Isotopes, 69, 982-987. 2. Royer, B., Cardoso, N. F., Lima, E. C., Vaghetti, J. C. P., Simon, N. M., Calvete, T., and Veses, R. C. (2009). “Applications of Brazilian-pine fruit shell in natural and carbonized forms as adsorbents to removal of methylene blue from aqueous solutions - kinetic and equilibrium study.” J. Hazardous Materials, 164, 1213-1222. 3. Lima, E.C., Royer, B., Vaghetti, J. C. P., Simon, N. M., Cunha, B. M., Pavan, F. A., Benvenutti E. V., Cataluna-Veses R., and Airoldi, C. (2008). “Application of Brazilian pine-fruit shell as a biosorbent to removal of reactive red 194 textile dye from aqueous solution kinetics and equilibrium study.” J. Hazardous Materials, 155, 536-550. 5. Annadurai, G., Juang, R. S., and Lee D. J. (2002). “Use of cellulose-based wastes for adsorption of dyes from aqueous solutions.” J. Hazard. Matter., 92 (3), 263-274. 6. Malik, P. K. (2003). “Use of activated carbons prepared from sawdust and rice-husk for adsorption of acid dyes: A case study of Acid Yellow 36.” Dyes and Pigments, 56(3), 239-249. 7. Chen, B., Hui, C. W., and McKay, G. (2001). “Film-pore diffusion modeling and contact time optimization for the adsorption of dyestuffs on pith.” Chemical Engineering Journal, 84(2),77-94. 8. Demirbas, A. (2009). “Agricultural based activated carbons for the removal of dyes from aqueous solutions: A review.” J. of Hazardous Materials, 98 (1), 234-237. 9. Ong S. T., Lee, C. K., and Zainal, Z. (2007). “Removal of basic and reactive dyes using ethylenediamine modified rice hull.” Bioresource Technology, 98(15), 2792-2799. 10. Vijayaraghavan, K., and Yun Y. S. (2008). “Biosorption of reactive black 5 from aqueous solution using acid-treated biomass of brown sea weed Laminar asp.” Dyes Pigments, 76, 726-732. 11. Alver, E., and Metin, A.Ü. (2012). “Anionic dye removal from aqueous solutions using modified zeolit adsorption kinetics and isotherm studies.” Chem. Eng. J., 200-202, 59-67. 12.Greluk, M., and Hubicki, Z. (2010). “Kinetics, isotherm and thermodynamic studies of reactive black 5 removal by acid acrylic resins.” Chemical Engineering Journal, 162(3), 919-926. 13. Shu, H. M., and Chang, H. F. (2005). “Effects of gap size and UV dosage on decolorization of C.I acid blue 113 wastewater in the UV/H2O2 process.” J. of Hazardous Materials, 118 (3), 205-211. 14. Doulati Ardejani, F., Badii, K., Limaee, N.Y., Shafaei, S.Z., and Mirhabibi, A.R. (2008). “Adsorption of Direct Red 80 dye from aqueous solution onto almond shells: Effect of pH, initial concentration and shell type.” J. Hazard. Mater., 151(2-3), 730-737. 15. Ong, S. T., Lee, C. K., and Zainal, Z. (2007). “Removal of basic and reactive dyes using ethylenediamine modified rice hull.” Bioresource Technology, 98 (15), 2792-2792. 16. Greluk, M., and Hubicki, Z. (2010.) “Kinetics, isotherm and thermodynamic studies of reactive black 5 removal by acid acrylic resins.” Chem. Eng. J., 162, 919-926. 17. Pagga, U., and Brown, D. (1986). “The degradation of dyestuffs: Part II. Behaviour of dyestuffs in aerobic biodegradation tests.” Chemosphere, 15(4), 479-491. 18. Santhy, K., and Selvapathy, P. (2006). “Removal of reactive dyes from wastewater byadsorption on coir pith activated carbon.” Bioresource Technology, 97, 1329-1336. 19. Bhattacharyya, K. G., and Sharma, A. (2005). “Kinetics and thermodynamics of methylene blue adsorption on neem (Azadirachtaindica) leaf powder.” Dyes and Pigments, 65, 51-59. 20. Ghanizadeh, G., and Asgari, G. (2012). “Adsorption kinetics and isotherm of methylene blue and its removal from aqueous solution using bone charcoal.” Reaction Kinetics, Mechanisms and Catalysis, 102(1), 127-142. 21. Sulak, M.T., Demirbas, E., and Kobya, M. (2007). “Removal of Astrazon Yellow 7GL from aqueous solutions by adsorption onto wheat bran.” Bioresource Technol., 98(13), 2590-2598.